We’re big caramel fans at my house, especially my husband, Chris. 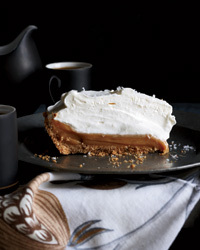 So when I saw this recipe for Salted Caramel Pie in a Food and Wine issue and saw how incredibly easy it was, I had to try it. I made it for dessert at Easter Dinner at my parent’s house last weekend. It was incredible. Mine didn’t look like the magazine slice above, but who cares? To make the crust, pulse the crackers with the butter and brown sugar in a food processor until combined and press into a 9-inch pie plate. Bake in a 350 oven for 10 minutes or so and then let cool. Turn oven up to 425 and poor the milk into a 9×13 glass baking dish. Sprinkle with a 1/2 tsp of salt and cover with aluminum foil. Put the dish into a roasting pan and add enough water to the roasting pan to reach 1/3 of the way up the baking dish. Bake, stirring the milk 2-3 times, until it’s golden and thick, about 2 hours. Add more water to the roasting pan as you go, if you need. The caramel may be lumpy, don’t worry. Scrape the caramel into the pie crust. Spray some Pam onto some plastic wrap and cover the pie. Refrigerate for at least 4 hours to set. Beat heavy cream in a mixer with confectioners’ sugar until thick and firm. When ready to serve the pie, mound the whipped cream onto the caramel and sprinkle with more salt (or not, we didn’t and it was just as good). I got requested by my husband to always have this on hand in the house. He liked it that much. « It’s rearing its ugly head….. This looks fantastic. I made some salted caramel chocolate bourbon cupcakes before and really liked the salty-sweet combo. I am putting this on my “to-make” list.